Ah, the Australian sunset. The reds, the pinks, the oranges- it's the perfect blend of peacefulness and fiery intensity. In honor of the Tour Down Under, Specialized has brought these colors to life in a limited-edition collection featuring their S-Works 7 Road Shoe. What makes the perfect cycling shoe? Is it exceptional power transfer? Superior Comfort? Undeniable style? The simple answer is "yes" to all of the above. 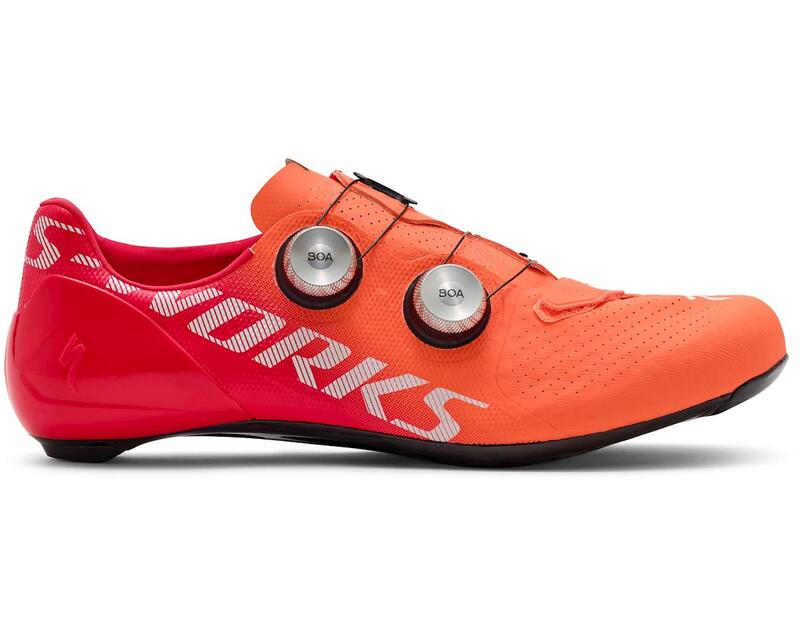 With the S-Works 7, you get a shoe with no compromises. In the comfort arena, Specialized kept all of the Body Geometry features you know and love, like the Longitudinal Arch, Varus Wedge, and Metatarsal Button. Each one of these features have been ergonomically designed and scientifically tested to not only boost power, but also to increase efficiency and reduce the risk of injury. They also took luxury into account by designing the S-Works 7 to have form that complements its function, so you'll find seams that are bonded together, rather than sewn, cleaning up the lines and contouring to your foot with slipper-like comfort. The custom CNC’d alloy BOA® dials also add some panache, but they also feature durable spring clutch internals and precise, one-millimeter micro-adjustments that let you perfectly dial in your fit.